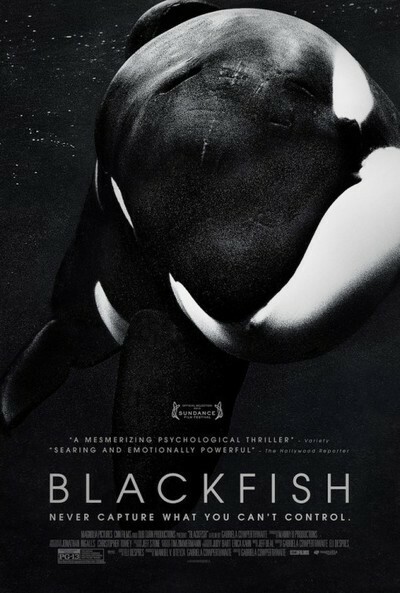 "Blackfish" is the newest example of subgenre of documentaries that could be the 21st century animal rights version of abolitionist pamphlets. "Sharkwater," about the organized butchery of sharks, "The Cove," about the mistreatment of dolphins, and Gabriela Cowperthwaite's new film about orcas aren't subtle, but they aren't trying to be. They aim to document abuse and inspire reform. Where 2009's "The Cove" exposed the theme park chain's role in dolphin kidnapping, abuse and slaughter, "Blackfish" does the same with orcas. It uses Sea World trainer Dawn Brancheau's 2010 death in a killer whale tank as a springboard for a tale of decades-long corporate conspiracy. Sea World is its main target, but the film also wants to attack received wisdom about humankind's dominion over nature, and make us feel guilty for treating fellow sentient beings as clowns. Once you accept that orcas are intelligent and emotionally complex creatures, it becomes impossible to shrug off the film's darker factoids as the cost of keeping families entertained. We learn how whale families, or pods, are hunted in their natural habitat, and how calves are separated from their parents, and how some pod members are killed on the spot. A grey-haired seaman recalls a sea park-financed calf hunt that ended with cow and bull carcasses being stuffed with rocks so that they'd sink the ocean floor. He weeps at the memory, and says it's the worst act he's ever been part of. Tilikum, the bull that killed Brancheau, has a history of violence, but given what he's been through we can hardly blame him. An appalling moment in "The Cove" revealed how a dolphin who played Flipper on TV got so depressed in captivity that she killed herself. You may be reminded that humans hang themselves in jail under less dire circumstances than these mammals endure. There's only so much abuse that a being can take without wanting to kill someone, or itself. Cowperthwaite, her editor Eli B. Despres (who also cowrote the movie) and her composer Jeff Beal invoke many genres: thriller, mystery, melodrama, snuff film. There are cartoon recreations of a court case pitting Sea World against the Occupational Safety and Health Administration, which forced the park to keep whales and trainers separate. There are graphic images of trainers being mauled and whales being "raked" by fellow whales in captivity, blood clouding the water. There were times when I wished "Blackfish" would trust its audience more. The archival bits— including robotically cheerful testimonials from a "typical" Sea World-loving family and a 1985 TV ad trumpeting the arrival of "Baby Shamu"—are so corrosively funny that they might have been spliced in from a Paul Verhoeven picture. The shots of whales lashing out in desperation and the closeups of tearful trainers begging forgiveness for their role in past abuse are innately powerful. Arguably none of these elements needed to be "helped" with "Monday Night Football"-style gimmicks and "you will cry now" music; but the filmmakers could counter with Malcolm X's "by any means necessary"—and perhaps they should. Sea World has issued a point-by-point refutation of some the charges. I doubt they'll reclaim sympathy by quibbling over details when the rough outlines of the orca trade are so grotesque. A third of the way through "Blackfish," I imagined myself as a child watching my family being murdered, then growing up in a prison where I had to do degrading tricks for cheering crowds who'd been assured that I adored the place. After a couple of months of that, I'd want to chew someone's leg off, too. We Have to Recognize Ourselves in Films: Gabriela Cowperthwaite on "Megan Leavey"
We Respond: D.A. Pennebaker & Chris Hegedus on "Unlocking the Cage"